Tag: Wither the Audience for Classical Music? Economists have long counseled reliance on markets rather than on government to decide a wide range of questions, in part because allocation through voting can give rise to a “tyranny of the majority.” Markets, by contrast, are believed to make products available to suit any individual, regardless of what others want. But the argument is not generally correct. In markets, you can’t always get what you want. 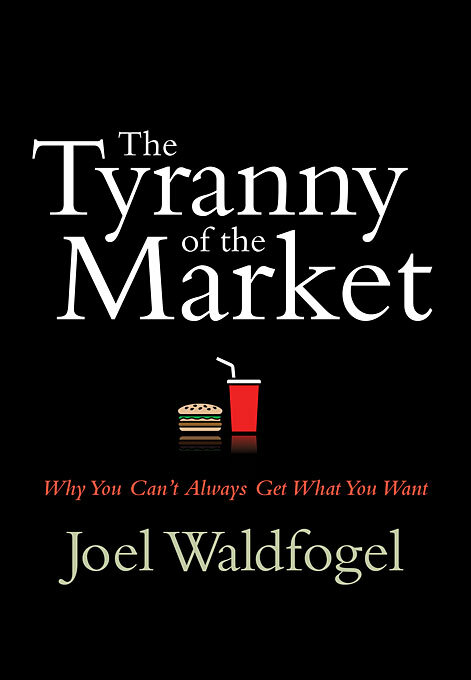 This book explores why this is so and its consequences for consumers with atypical preferences. When fixed costs are substantial, markets provide only products desired by large concentrations of people. As a result, people are better off in their capacity as consumers when more fellow consumers share their product preferences. Small groups of consumers with less prevalent tastes, such as blacks, Hispanics, people with rare diseases, and people living in remote areas, find less satisfaction in markets. In some cases, an actual tyranny of the majority occurs in product markets. A single product can suit one group or another. If one group is larger, the product is targeted to the larger group, making them better off and others worse off. The book illustrates these phenomena with evidence from a variety of industries such as restaurants, air travel, pharmaceuticals, and the media, including radio broadcasting, newspapers, television, bookstores, libraries, and the Internet. Waldfogel’s basic thesis is that given high fixed costs, those who are members of a preference minority are far less likely to get products they desire. Through his research he demonstrates that as the population of a particular preference group increases, the members of that group are more likely to be satisfied by the range of choices available to them and vice versa if the population of a particular preference group decreases. Categories Music, Research•Tags Anne Midgette, Audience demographics, concert hall, Demographics, Douglas Dempster, economics, electronic technology, ethnic groups, ethnic minorities, Harmony: Forum of the Symphony Orchestra Institute, Harvard, Harvard University Press, internet, Joel Waldfogel, minorities, NEA survey, NEA survey: good news - bad news, Orchestra, preference minority, symphony concert hall, The Classical Beat, The Tyranny of the Market, The Tyranny of the Market: Why You Can't Always Get What You Want, underserved audiences, Washington Post, who benefits whom, Wither the Audience for Classical Music? I was going to post something else, but had come across this piece, “Wither the Audience for Classical Music?,” by Douglas Dempster (while he was Dean of the Eastman School or Music) in the Harmony: Forum of the Symphony Orchestra Institute yesterday. I had posted some snippets in the cello chat thread I started (that I mentioned in a previous post), but have also had a discussion exploding after I posted a link to Michael Kaiser‘s (President of the Kennedy Center) piece, “The Orchestra Conundrum,” on my facebook page where I mentioned some of Dempster’s analysis. Rather than bog this down with my own poor prose, I’ll just quote some of the more interesting bits and let you peruse the links to discussions above if you want more of my thoughts on the issues. Also of note, and relevant to this issue. The Detroit Symphony Orchestra has cancelled the rest of their season. Categories Music•Tags Cello Chat, Classical Music, Detroit Symphony Orchestra, Detroit Symphony Orchestra cancels the rest of their season, Douglas Dempster, Eastman School of Music, Harmony: Forum of the Symphony Orchestra Institute, Internet Cello Society, John F. Kennedy Center for the Performing Arts, Kennedy Center, Michael Kaiser, Orchestra, Recording Industry, The Orchestra Conundrum, Western Classical Music, Wither the Audience for Classical Music?